…there’s fire. Unfortunately, western North America has seen more than its “fair share” of wildfires this past summer caused by drought and unusually high temperatures. Of course we had it easy as living fulltime in a motorhome enabled us to leave an area whenever the smoke and haze began obliterating the views. However, we certainly felt sympathetic to those living in countless communities who were impacted by fires. Unfortunately, with Global Climate Change it could be we are getting a look at things to come. Speaking of smoke… I recently had the “opportunity” to observe just how much of it you get when driving a motorhome that’s towing a car down a steep, narrow, winding road with defective brake pads. But that’s an “adventure” I’d rather forget. 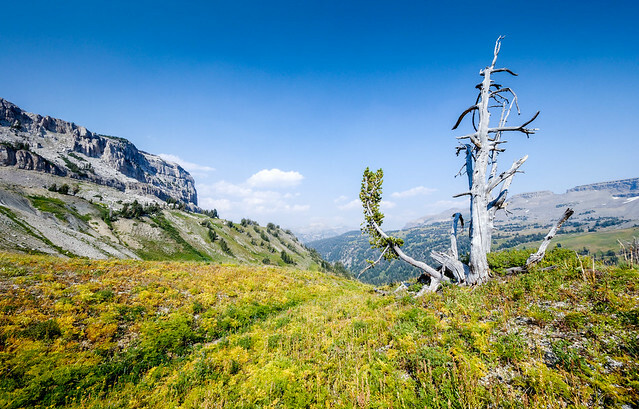 In early July we did quick trips through Yellowstone National Park and Grand Teton National Park in Wyoming with John’s sister Elizabeth (with plans to return to Grand Teton National Park and do some backpacking after she went home). 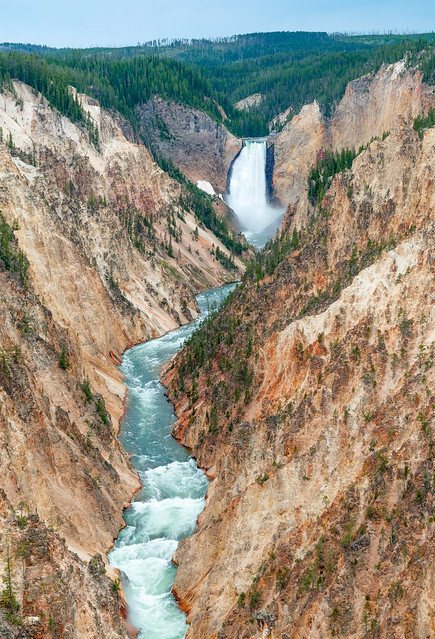 Yellowstone National Park is probably best known for its geothermal features with Old Faithful being the most famous. 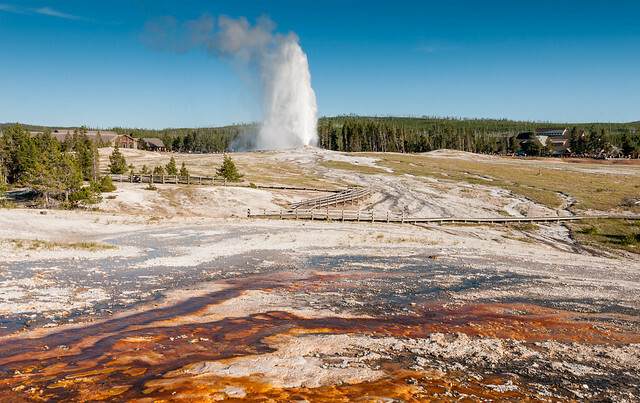 We chose to avoid the crowds immediately surrounding it and viewed its eruption from the Upper Geyser Basin boardwalk. 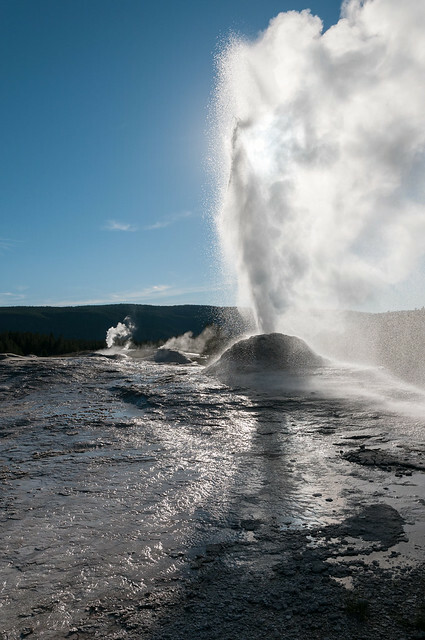 The Upper Geyser Basin never disappoints visitors who are willing to spend enough time keeping their eyes open for increased activity from the many geysers in the area. We considered ourselves extremely lucky to witness this eruption by Lion Geyser, the largest within the “Lion Group”. 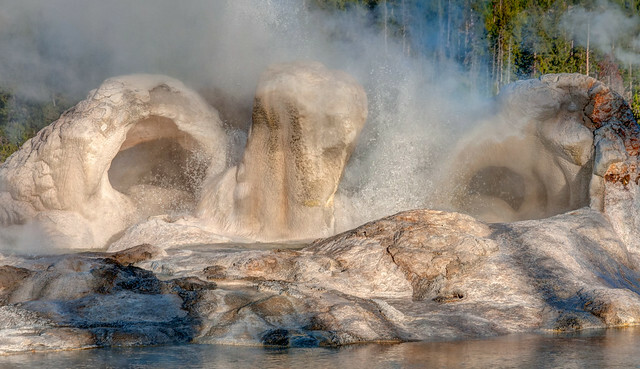 Grotto Geyser has what could be the most complicated and unusual shape of the geysers. 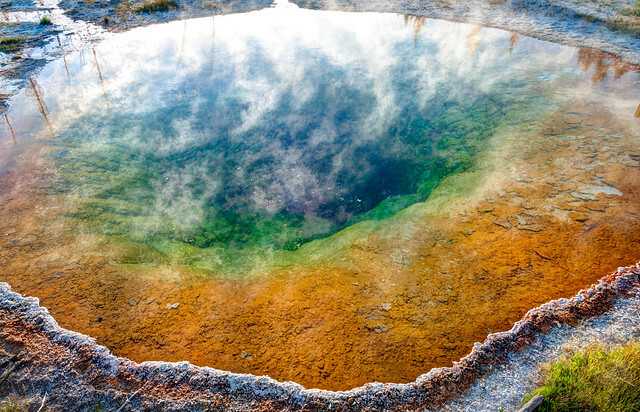 In addition to the volatile geysers Yellowstone is also home to countless hot springs and Morning Glory Pool is one of my favorites. We also visited Mammoth Hot Springs which is aptly named for the immense size of the collection of features. Perhaps the most famous feature the Minerva Terrace which consists of a series of terraces that reminded me of an elaborate ancient Greek Temple. When I first saw it in 1977 the spring was still active and the formation was covered by steaming flowing water. However, some minor earthquake activity caused the spring vent to shift and the terraces are now dry. It also appears that many of the other springs are flowing less than we've seen in previous visits. We did a quick walk through the area but hordes of tourists did more to dampen our enthusiasm than the brief downpour. 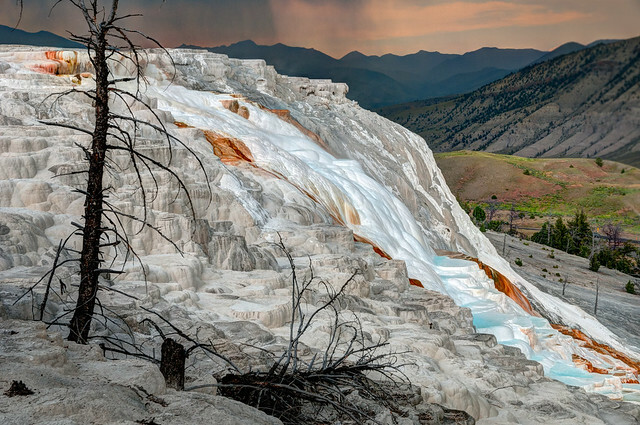 Mammoth Hot Springs is still worth seeing for those have never seen it before but for those of us who saw it back when the springs were still flowing it feels like we are visiting a graveyard. 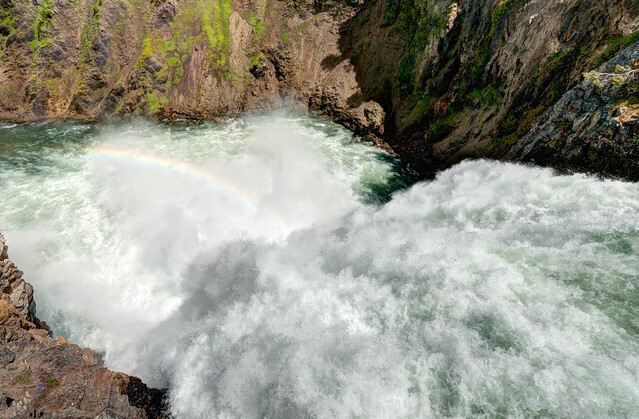 … but we also did the short but steep walk down the extensive metal stairway on Uncle Tom’s Trail for a closer view of the falls up the canyon. If you look closely you can see the people at the overlook of the “Brink of the Falls Trail” jusy to the right of the top of the falls. The “Brink of the Falls Trail” overlook provides a unique view of this stunning falls. 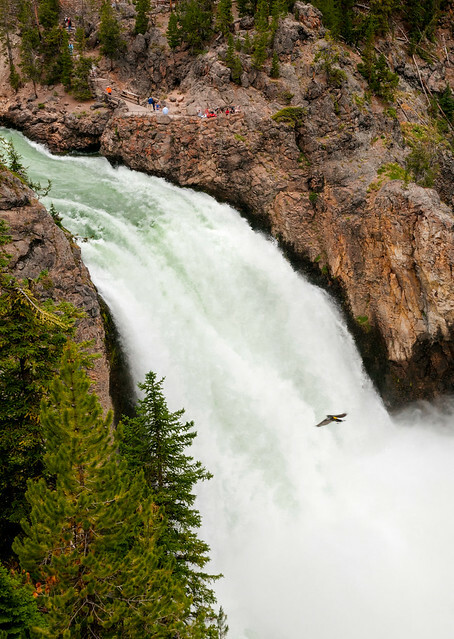 I believe the bird seen flying near Upper Yellowstone Falls in the photo below is an Osprey. We didn't have binoculars with us this time but on past visits we have observed several Ospreys including two who were tending some chicks in a nest as well as one flying off with a fish. Yellowstone is also known for its abundant wildlife. We no longer get excited about deer or elk (especially elk who insist on walking slowly down the center of a road). We don’t have the patience of those affectionately known as “Wolfies” who spend hours at pullouts with spotting scopes in the off chance of sighting some of Yellowstone’s wolves. 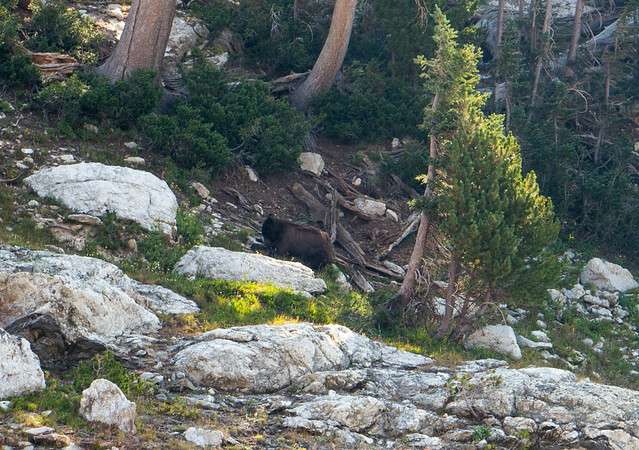 However, seeing a bear is undoubtedly the most coveted wildlife experience for visitors. A sighting of a bear from a roadside, no matter how distant, can cause traffic through the park to grind to a halt. Park Rangers do their best to break up these “Bear Jams” but the best they can do is motivate drivers move at a slow crawl. We got pretty impatient with the traffic but we were there in the height of tourist season. In addition we have had good luck seeing bears in the backcountry that seeing a little brown dot in the distance just doesn’t mean anything to us. Bison, on the other hand are plentiful visitors can’t help but see them. When we saw a herd of Bison near a pullout John wanted to get closer to them for better photo opportunities. They give the illusion of being docile but we kept a respectful distance. 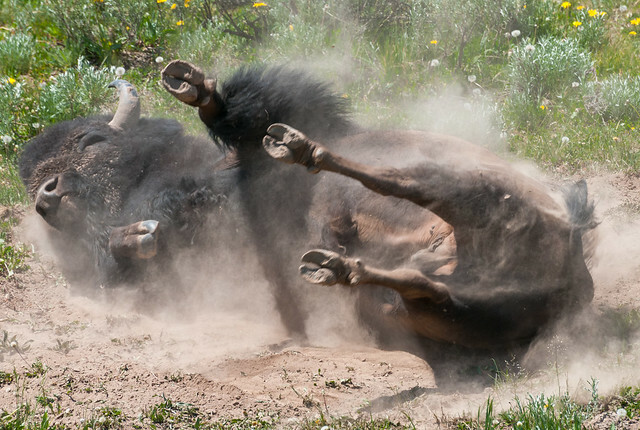 We were treated to quite a show when one bull took an extended dust bath not far from us. 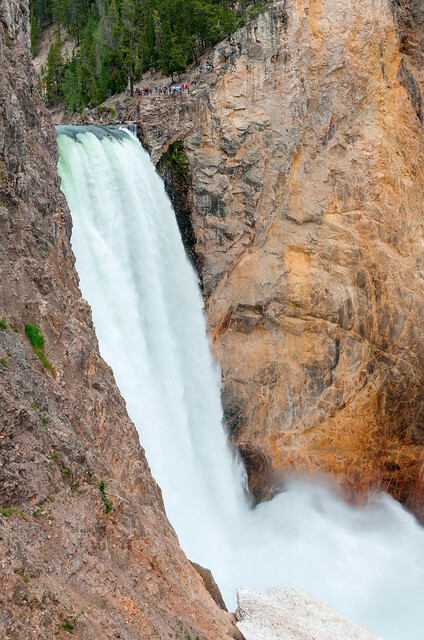 All of our Yellowstone National Park photos are on Flickr. We then headed to Grand Teton National Park for a quick visit while John’s sister was still with us. 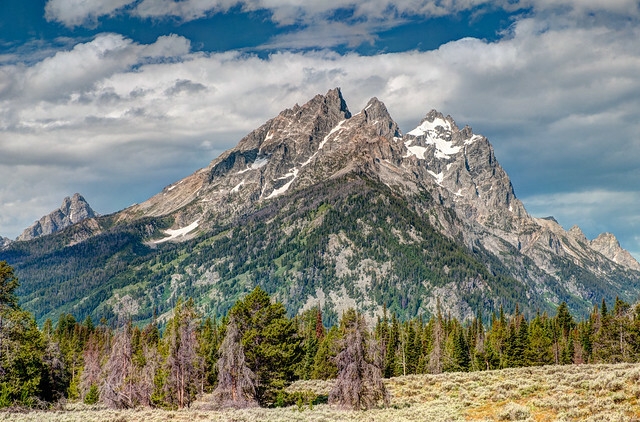 Grand Teton is not a huge park and one can see the prominent features all from one roadside pullout. 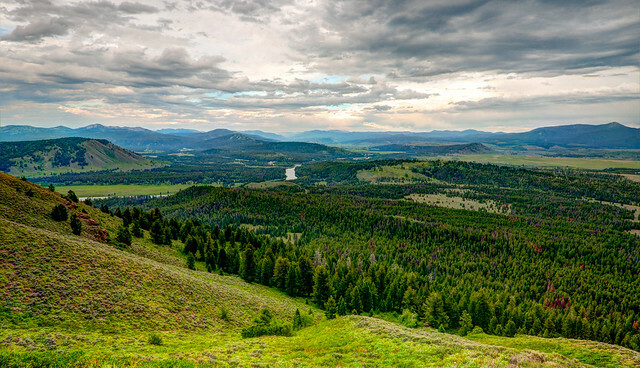 We took a drive to the top of Signal Mountain and had an expansive view of the Snake River and surrounding valley below. We decided to do a short dayhike up the Cascade Canyon Trail. We opted to take the quick ride on the boat shuttle across Jenny Lake rather than taking the time to walk about two miles around the lake. Once off the boat we took the short side trail to see Hidden Falls. 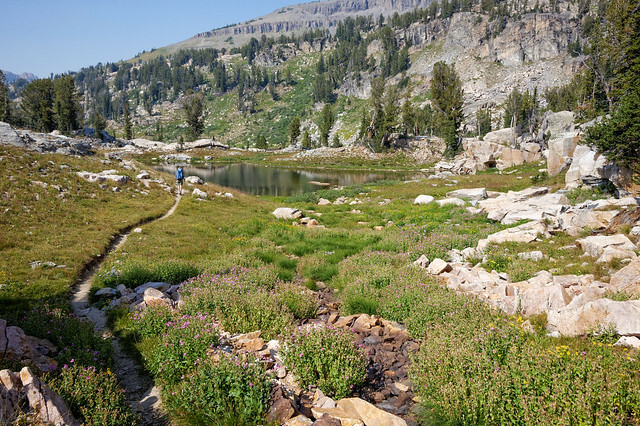 … as well as Jenny Lake (not to mention a getting brief look at a black bear as it ran from the trail ahead of us). 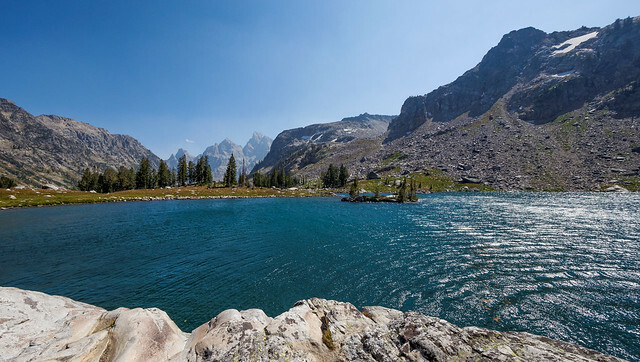 Of course the star of the park is Grand Teton itself. 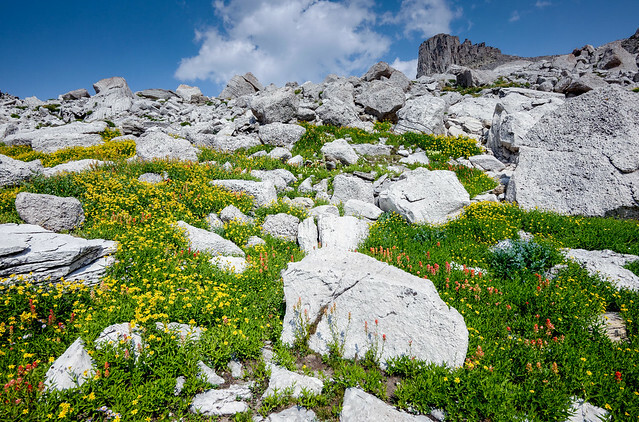 All of our Grand Teton dayhike and sightseeing photos are on Flickr. After seeing Elizabeth off at the airport in Bozeman (and getting new brake pads) we enjoyed a visit with our sons in Montana. After seeing the boys off at the airport we headed back to Grand Teton National Park where we wanted to do some backpacking. 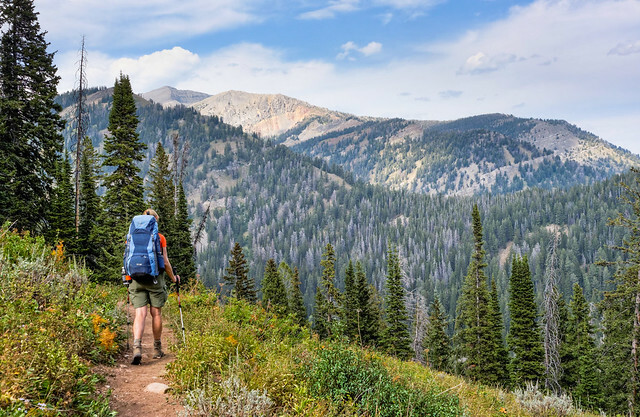 We obtained a permit for a 5 day/4 night backpack trip on the Teton Crest Trail starting outside of the park on the Phillips Canyon Trail and coming out on the Paintbrush Canyon Trail. 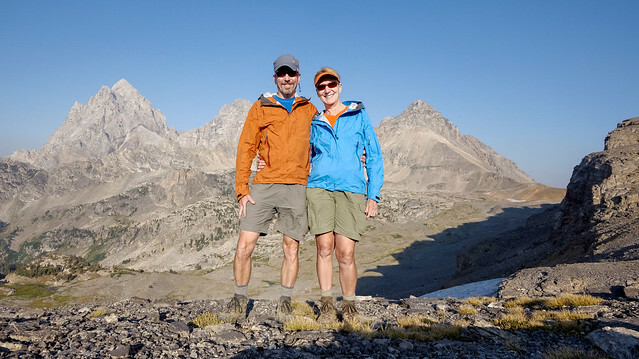 Some choose to access the Teton Crest Trail by starting at Teton Village. 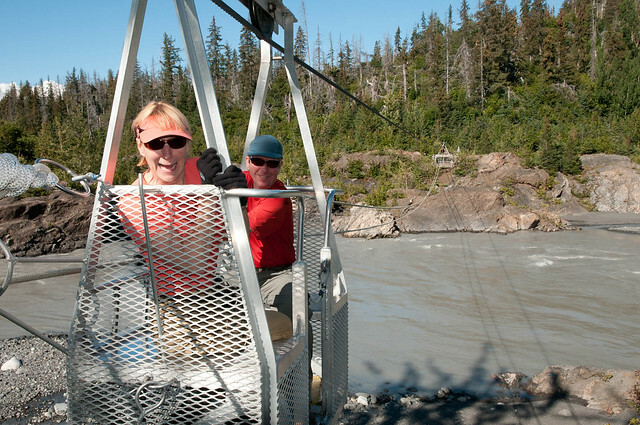 There are two options, one can hike up about 7 miles gaining over 4,000 feet or one can take Aerial Tramway. I suppose starting in Teton Village could simplify transportation logistics and taking the tram would save time but to us it just seems like cheating. We enjoyed the additional scenery as well as a break from the crowds. Having a car as well as a motorhome gives us a distinct advantage over many in that enables us to self shuttle. 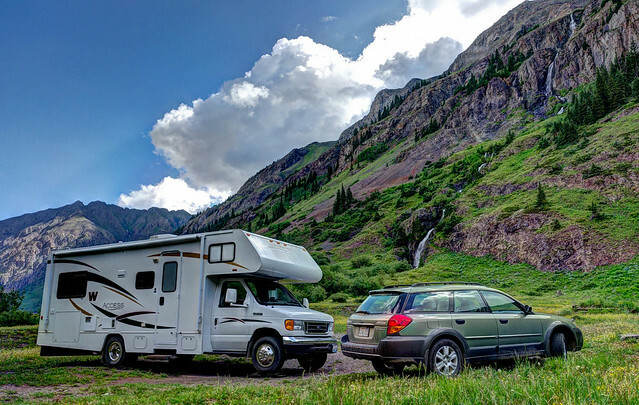 We parked our motorhome in the String Lake Parking lot and drove our car on SR 22 toward Teton Pass to the parking area at the Phillips Canyon Trailhead. 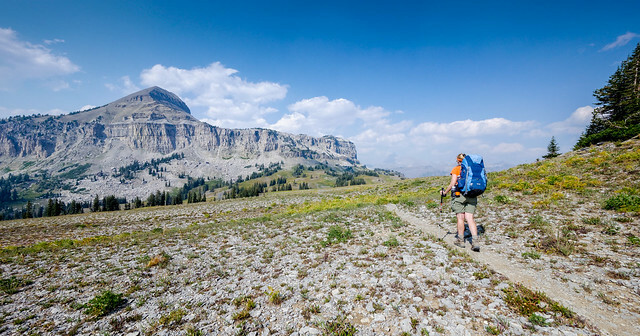 Once we get to the Teton Crest Trail we’ll have several passes to cross and Phillips Pass provided us with an easy warm up. 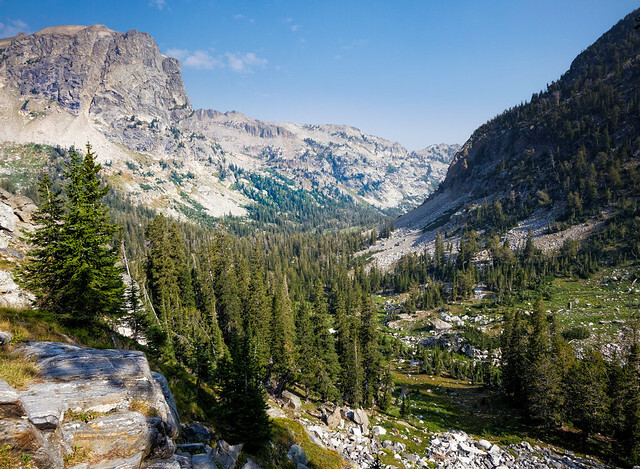 … before heading over Fox Creek Pass where we started getting our first views of the Tetons in the far distance. 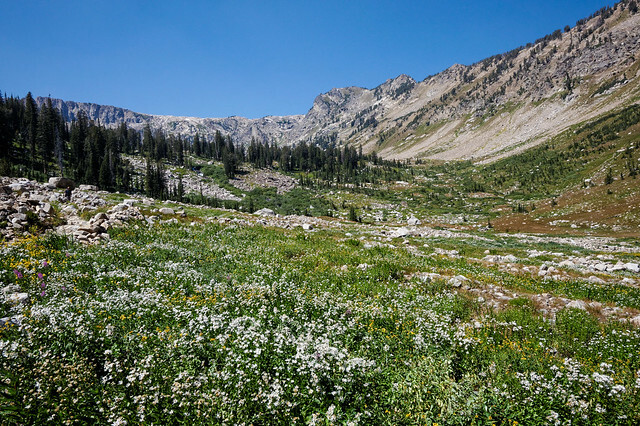 Shortly after we crossed Fox Creek Pass we entered an area known as the “Death Canyon Shelf”. 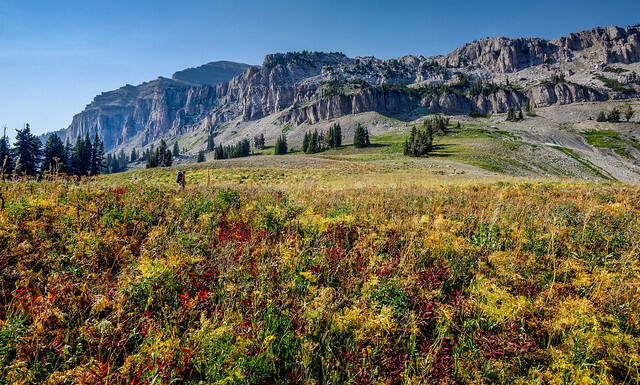 I don’t know how “Death Canyon” got its name but it didn't seem that the shelf above should have to share its unfortunate name as it seemed very much alive with trees, grass and wildflowers. 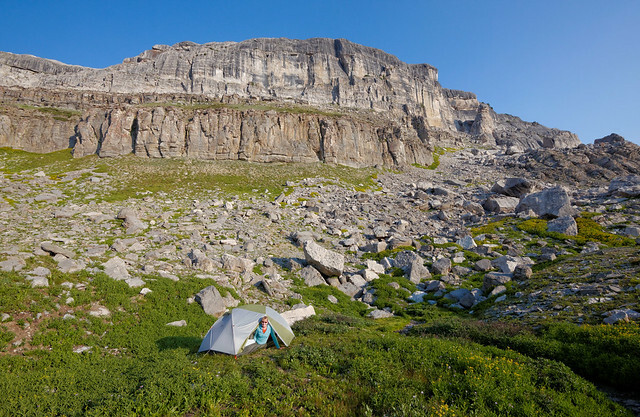 Backpackers in Grand Teton National Park are required to camp within designated “Camping Zones” and on our second night out we camped in the Death Canyon Shelf camping zone. The next day we crossed over Mt Meek Pass and entered a lovely area known as the Alaska Basin which is actually not within park boundaries but is in the Caribou-Targhee National Forest AKA the Jedediah Smith Wilderness (I’m not sure why the National Park couldn't simply annex it, it would have made key wording and captioning John’s photos so much easier). 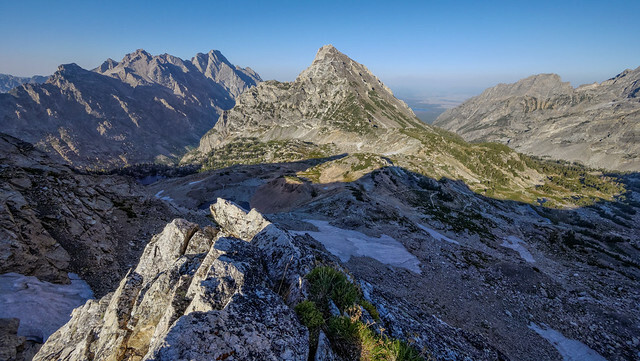 After crossing the Alaska Basin we ascended to Hurricane Pass and began getting some of our best views of Grand Teton, Middle Teton and South Teton. We also crossed over the National Park boundary, again. 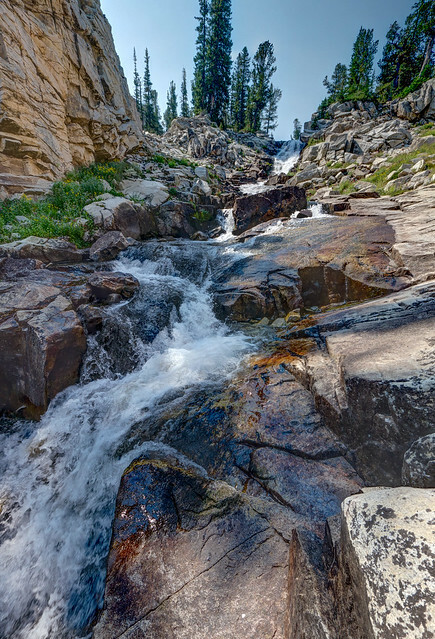 We spent our third night in the South Fork Cascade Canyon Camping Zone. 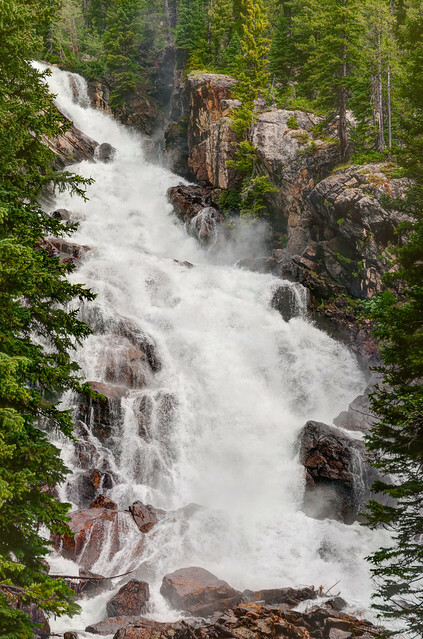 … past a lovely falls on South Fork Cascade Creek. 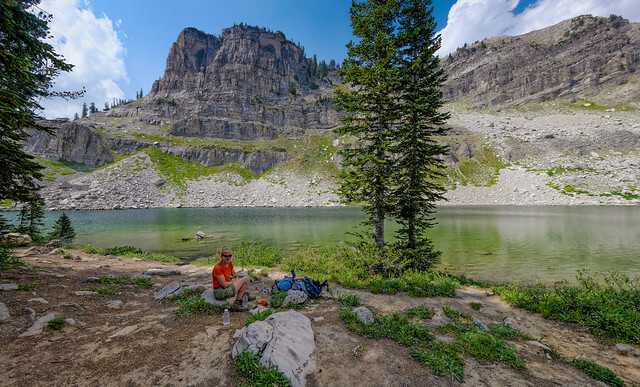 … to the beautiful incredibly blue Lake Solitude. We then headed up our final pass on the trip, Paintbrush Divide. While the view from the pass allowed us to see other peaks such as Mt Moran we were disappointed to see the smoky haze hanging over the Jackson Hole area in the distance. We camped our last night in the Upper Paintbrush Canyon camping zone. It had become quite windy and we were hoping to find a protected spot for our tent. We had seen several tents clustered near a creek so we sought out a more private spot and found one situated on a small knoll protected by some shrubs and trees. Our last morning out provided us with some excitement. We were in the process of packing up and had the tent down but we had not finished organizing our food so our bear canister was open and our bags of day food were out sitting on a rock. We were sitting opposite each other and had been talking when all of a sudden John started yelling “Get out of here bear!” I turned around and there was a huge head sticking out from the shrubs about eight feet away from us. We both knew we had to stand our ground as our gear, especially our food, was too scattered for us to gather it all up and slowly back away. Fortunately this bear didn’t appear “agitated”, he wasn’t “huffing” or clacking his teeth. He just stood there. It became apparent that yelling wasn’t enough to chase it away so John got his bear spray out (although I know he really wanted to get his camera instead) and I started throwing rocks at it. I didn’t want to actually hit it for fear I would injure an eye or it would just make it mad. But after it still refused to move I started throwing larger and larger rocks at him (fortunately there were plenty to choose from). It finally ducked back into the shrubs only to try to approach from the side around some adjacent rocks. I had wanted to make sure it had left the area so I was ready for it. This time I did try to hit him and I think I was successful as he finally ran off but stopped every few yards to lick his left fore paw. In hindsight it seems funny because we and the bear must have had the same perplexed expression on our faces. We had assumed that once we made a lot of noise and threw rocks at it and stood our ground that the bear would just leave. The bear apparently assumed that once he stuck his head through the bushes and just looked at us that we would leave and he could get our food. Unfortunately it is obvious that this bear has been successful in the past at obtaining food from backpackers by approaching them in this way. 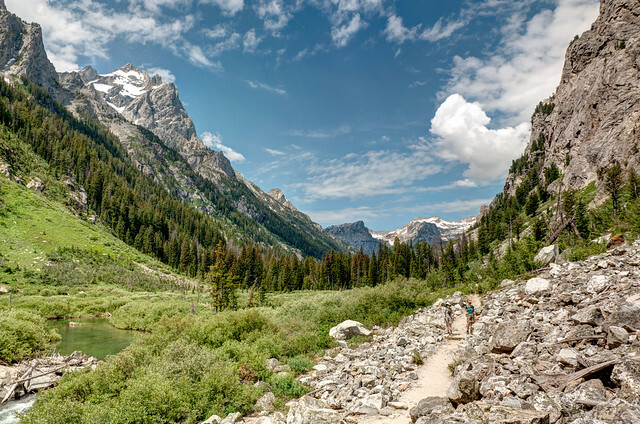 Grand Teton National Park does require the use of bear canisters and will loan them out if needed. The Park Service does provide some excellent written materials regarding bear safety but we think Park Rangers at Denali National Park do the best job educating backpackers on bear safety. They very effectively put the “fear of God” into you and tell you that the only food you should have outside of your locked bear canister is what you are in the process of eating. We were embarrassed by how lackadaisical we had become. We are relieved that we didn’t allow the bear to get any of our food as the saying is “A fed bear is a dead bear” and neither of us want to be the one who signs a bear’s “death warrant”. Hopefully, being hit on the paw with a rock will help discourage him for at least a little while. 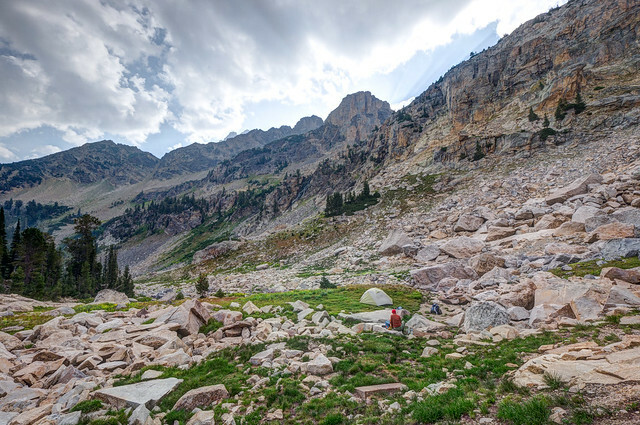 All of our Teton Crest backpack trip photos are on Flickr. 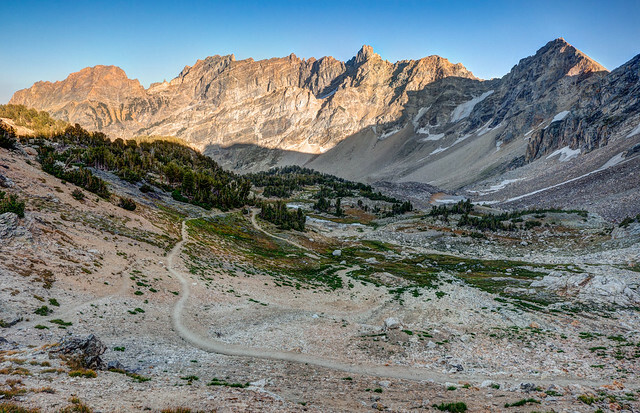 We left Grand Teton National Park and headed east toward an area we have wanted to visit for a long time, the Wind River Range, where we plan to get a couple more backpack trips in before heading south for the winter. Christmas will be here soon and we are really looking forward to having our sons, Dan and Tom, come for a visit. We’re in Cottonwood, Arizona (about 150 miles north of Phoenix) and this will be the first winter that John and I have spent outside of the wet grey Pacific Northwest since 1977 (not that winters in Chicago and Louisville were all that great). For the boys it will be the first winter away in their entire lives without wet grey days so the warm sunshine will be a treat for all of us. Obviously the way we spend Christmas as a family has changed since we have been traveling fulltime in our motorhome. The first two years were easy as both boys lived in western Washington and Dan had a large enough apartment for all of us to get together there. However, in February 2012 Dan landed his “dream job” as Senior Electrical Engineer with Carnegie Robotics. It’s perfect except that it is located in Pittsburgh, Pennsylvania. So we needed a new tactic for getting together and what works well is for us to stay in a campground that also has small cabins for rent. We did this in July when they both came to visit us in Montana. 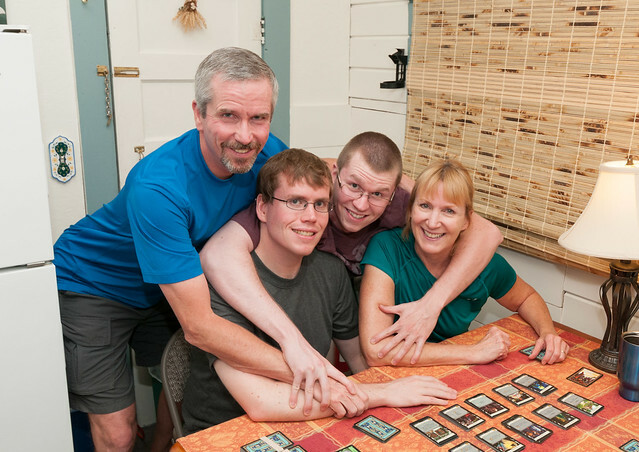 … but primarily we played Dominion a lot and ate too much. However, despite getting along pretty well as children, as adults they essentially have no contact with each other beyond their visits with us. The only exception I am aware of was when Tom had some computer problems and used Dan for “Tech Support”. So I have wondered what kind of relationship they will have with each other once they have families of their own especially after John and I are both gone. I hope they maintain some contact because neither of them will ever meet another person who understands just how crazy their mother was. But it will be what it will be. However, this got me thinking about the relationships that I have had with my own parents and siblings since becoming an adult. When I decided to write about it in this part of the blog (that I now call my “Reflections” for the lack of a better name) I knew that John wouldn't be enthusiastic about the topic because he is too aware of the many “issues” I have had with members of my family. He dislikes it when I visit any of them because he says I always come back a little “damaged”. So he tactfully suggested that I write about something different, something that would have a broader appeal especially since the last thing I wrote was also introspective and personal. I agreed with him that there are far more interesting topics and I did look through my list of ideas. The problem was that I couldn’t make myself think about any of them and the whole point of this part of the blog, my “Reflections”, is that I get to write about what I actually do think about. So, anyone who doesn’t relish the idea of being my surrogate Counselor is encouraged to stop reading now and go do something more interesting. However, if you choose to keep reading then I have to warn you that it could take a while for me to come to some sort of positive resolution for my family “issues” because that is my goal. It might seem that it would be more helpful for me to actually talk to a Counselor but our nomadic lifestyle makes that challenging. Besides, I’ve seen counselors in the past and have a pretty good understanding of the process. It might also seem that it would be more appropriate to write this in a private journal rather than posting it on the internet. However, I think it is beneficial for me to share this with others because I know it will help keep me honest and less inclined to just feel sorry for myself. In addition as I have to proofread it several times it gives me multiple opportunities to be more objective about the content, something I wouldn’t get if I was saying this aloud only once to another person. My goal is to work through this stuff here so John won’t have to listen to me talk about it again (and again) because I know he is quite tired of hearing about it. He has struggled to understand why I don’t “just let it go”. But he can’t identify with me as his childhood was quite different than mine. He was the long awaited second child as well as the first boy. His one sister was ten years old when he was born and she doted on him as much as his parents did. He had a pretty good relationship with his parents and over the years has become quite close to his sister. Granted, their family was not “perfect”, no family is. However, some families simply exist in better circumstances than others; mine for example. I am the fifth of six children and by the time I came along having a baby was nothing special. Dad owned a small Television Sales and Service business and often made “service calls” to fix a customer’s TV in their home. When Mom went into labor with me he decided to stop and make a service call on the way to the hospital. He left her to wait in the car parked in the customer’s driveway while he was inside repairing a TV. Dad did get her to the hospital in time but who knows, if I had been cooperative enough to have been born in the car then maybe they could have skipped the hospital (and the bills) altogether. Maybe there would have even been enough time for him to make another service call on the way home. They certainly could have used the money. When I was born my oldest sister was 7 ½, my second sister was not quite 6 and my third sister was exactly 4 years old as I was born on her birthday (does that seem fair?). In addition my brother was only 18 months old and “sickly”. After our first son was born and he seemed pretty “easy” I got curious about what sort kind of baby I had been so I asked Mom. Her response was to look up with an unfocused gaze, put a hand to her mouth and slowly say, “I think you were a quiet child”. 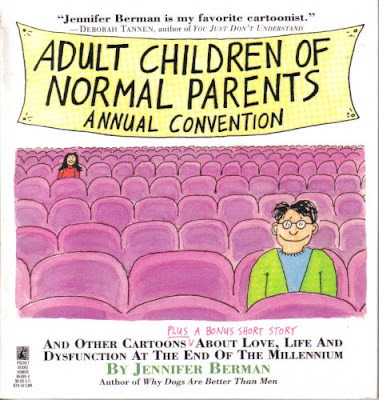 But I certainly can’t criticize Mom for having so little memory of my infant-hood. Because I can’t even imagine what it was like for her with that many young children to care for especially after our little brother was born five years later. He has Down’s Syndrome, or as he was called back then, a “ Mongoloid Idiot Child”. To make things worse, Dad’s business struggled to make enough money to support such a large family and became heavily in debt. He couldn’t pay distributors for the televisions he had already sold. In order to fool them he kept the empty boxes in his storeroom so he could claim he had not yet sold them. Apparently he once he even pulled a gun on the fellow from the Electric Company who had been sent out to shut off the power because of our unpaid bills. Needless to say he was under incredible stress and not surprisingly turned to alcohol which did nothing for his volatile temper. Mom, on the other hand, just became depressed. We were just another Great American "Dysfunctional Family". It is common in families such as ours for each child to take one of the basic roles; “Hero” and “Scapegoat” are two “popular” ones. Obviously my older sisters and brother got first pick so I was stuck with whatever was left over. I got to be the “Lost Child”. 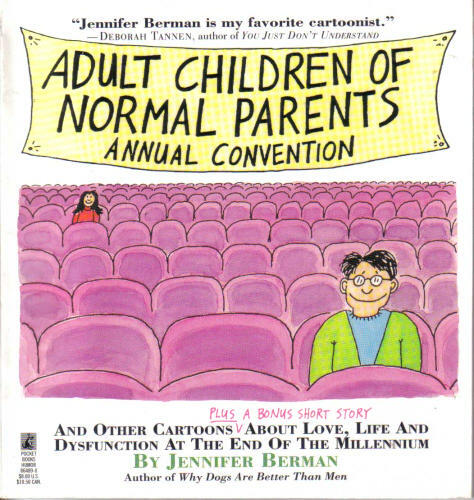 Of course our family was really not that unusual and I remember laughing when I saw an illustration on a book cover that humorously mimicked the Adult Children of Alcoholics organization. In addition to the different “roles” my siblings and I held we all have different temperaments. I initially got along pretty well with my older brother while we shared a room but that apparently ended when I was about six and was moved downstairs to share a room with my three older sisters. They were all more assertive and I had trouble holding my own in their games as well as their arguments. In addition they all picked on our brother who in turn picked on me. As our mentally retarded little brother was off limits I didn’t get to pick on anyone. I felt overwhelmed and was frightened by Dad’s anger when he felt compelled to intervene in our squabbles. So, out of self preservation, I withdrew. If a picture is indeed worth a thousand words then I think this photo taken on a family outing to Fort Harrod State Park says quite a bit about how I saw myself in this family. Sad as all of that sounds, it is not my intention of this becoming a “poor, poor, pitiful me” rant (at least not too much). The fact is that I am a loaner by nature and throughout my life I have needed a fair amount of quiet and solitude. I have always loved the outdoors and can remember playing happily by myself at our grandmother’s house just down the road from us. I even lived with her at times. She had a huge yard with trees and shrubs that were full of secret places where I could construct cozy rooms with leafy walls. 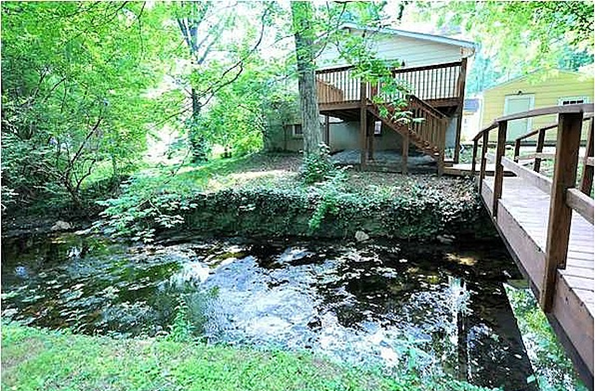 It also had a creek flowing through it and I could spend hours playing in the water, picking up rocks to see what lived under them. When I was a little older I ventured out to explore the nearby woods and imagined that I was out in some faraway wilderness. Time passed and one by one, my older siblings and I grew up and moved out of our parent’s house. We all eventually left our home state of Kentucky. While they still lived relatively close to Mom and Dad; Indiana, Maryland and North Carolina, I moved clear across the country to Washington State. It was as if our lives as adults mimicked our positions in the Fort Harrod photo; their forming a ring around our parents with me choosing to be a significant distance away. 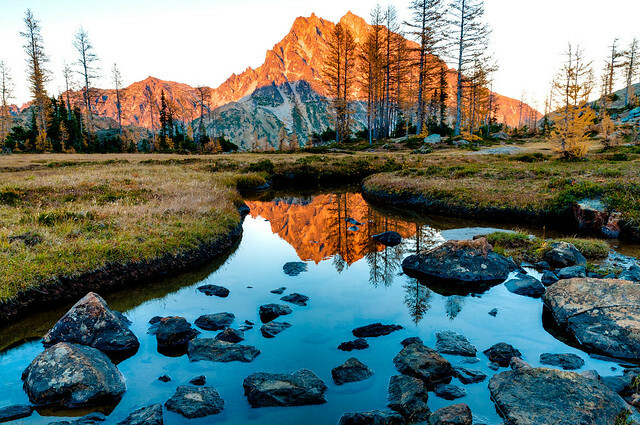 But where I look sad in that photo I loved Washington State, especially the huge evergreen trees but most of all, I loved the mountains! I did go back east periodically to visit family; for weddings and reunions as well as Dad’s death. But no matter what the occasion it seemed that when my siblings and I got together we all reverted to the roles we had held as children. At times I still felt like that little girl in the photo, standing off to the side. However, even though it looks like the family in that circle is close, it is an illusion because even as adults none of my other siblings got along particularly well. I definitely was not the only one who had “issues” with our parents and each other. So our family gatherings could still be noisy and contentious and I could still feel overwhelmed. I did eventually make peace with both of my parents although it didn’t happen with Dad until after his death. However when I did with Mom she was 85 and very much alive. It happened during a road trip when I drove her to her younger brother’s funeral. It took 11 hours and we talked the entire time. I was gratified that she was interested in hearing about what I had been doing; volunteering on local school funding campaigns as well as lobbying our state legislature with Washington State PTA for better state level education funding. I had created websites, newspaper ads, campaign mailers, flyers and written numerous letters to the editor of local papers. Mom was really impressed by all that I had done. At the end of the trip she said was proud of me and that she felt that she had “gotten to know” me for the first time. During that drive Mom also said “I always knew you’d be a ‘Late Bloomer’, I just didn’t know how long I’d have to wait”. The fact is that when I was growing up it seemed that anything I might have been interested in (music, dance, athletics, academics, art etc) had already been done better by someone smarter, someone more talented, or someone who was simply older. They each got to “perform” on their respective “stage” (either real or figurative) and the rest of us served as part of their “audience”. But, as I had no “talent” (apparently playing in creeks and exploring forests didn’t count), I never “performed” on a “stage” with an “audience” of my own. That is not until much later when I was involved in all those the school funding and campaign related activities. I received quite a bit of recognition from people in my community in the form of gratitude and awards. For the first time I was “performing” on a “stage”, receiving “applause” and I liked it. However, after awhile I just got too burned out and retired. Besides we were beginning to make plans to sell our house and hit the road. After that, as I had no other “talent”, I assumed that I my “performing” days were over. However, I have recently decided that I do have another “talent”, backpacking. 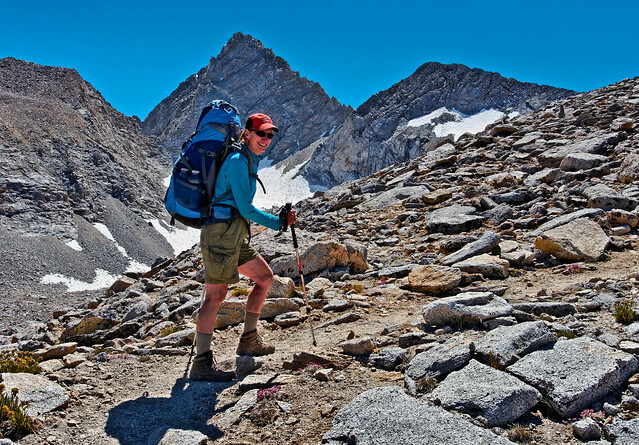 The way I see it is that I’m 58 years old (with arthritis in my knees) and I can still carry a heavy pack for miles on a rough trail at high altitude while gaining and losing thousands of feet of elevation. I can eat freeze dried food and sleep on the ground. I can be hot, I can be cold, I can even stand up to a grizzly in our camp, AND I can do it all without getting too grumpy! 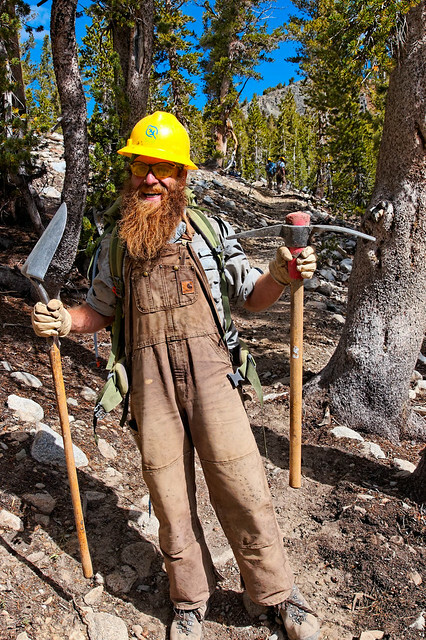 Hiking the John Muir Trail last year was perhaps my greatest “performance”. The only downside to having my “stage” in the backcountry is that “performances” are not easily attended. My “audience” consists primarily of young backpackers who are “inspired” by seeing “older people”, like us, still out backpacking. Unfortunately, it is impossible for less fit individuals who aren’t “outdoorsy”, such as my siblings, to attend any my “performances” or “applaud” my efforts. When John retired and we started traveling fulltime the idea of doing a blog about our travels appealed to me. I had enjoyed creating and organizing the websites during my campaign days and I was going to need something to do while John spent countless hours editing and post processing his thousands of photos. So I started the blog and have come to see that this is also a “stage” that I “perform” on. I did experience some “stage fright” at first, especially with this part of the blog. However, thanks to the great “applause” I have received from many blog readers I have gradually became more comfortable “performing” on this “stage”. A major difference between this and my backcountry “performances” is that anyone with internet access can attend my blog “performances” including my siblings so I made a point of offering them a “front row seat” by emailing them as soon as I had updated it. After we had been on the road for about nine months I wrote something about my coping with fear. I tried to make it funny but since I wasn’t on a real stage with a live audience, I had no way of knowing if I succeeded unless somebody commented on it. I was disappointed that none of my siblings did. Not long after that I was back east and had the opportunity to ask two of my sisters in person if they ever read the blog. I suppose I wasn’t really surprised when they both answered no. 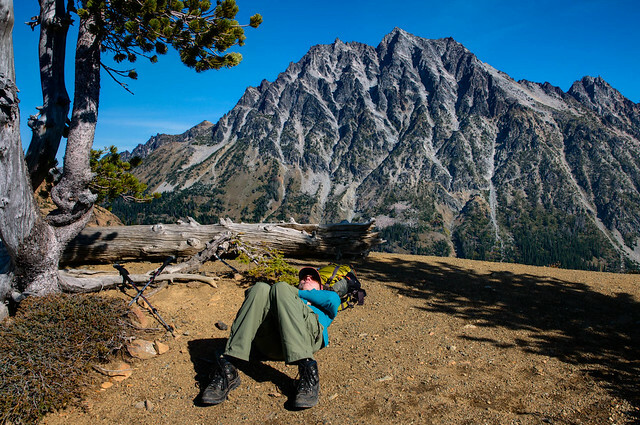 One said she didn’t because she had no interest in reading about backpacking. The other said many people want her to read their blogs; she associates her computer with work etc. I knew that if neither of them read it then I could be certain that the other two didn’t either. I have to admit this hurt my feelings and just seemed unfair. Because even though I find southern small town Community Theater a bit painful I attended most of the plays that the first of those sisters was in. And despite the fact that I have no interest in quilting or the history of textiles I bought and read the book that the other sister had written. In addition, while I am not a fan of contemporary classical music I attended the premiers of two of my brother’s compositions. I didn’t become a part of their “audiences” so that they would feel obligated to reciprocate in the future. I did it because they are family and they matter to me. I thought it was appropriate for me, as their sister, to be a part of their “audience” and enthusiastically “applaud” their “performances” no matter what “stage” they were on. I thought that it was only fair that when I finally got a turn at being on the family “stage” that at least one of them would be willing to be a part of my “audience”. Especially since reading the blog is not like attending a live performance in an auditorium where they would have to get dressed up as well as have to wait for “Intermission” before they can go to the restroom. The fact is that they could attend any of my “performances” from the comfort of their own homes. They could wear their pajamas (or nothing at all for that matter) AND they could get up and go pee anytime they wanted to. So it didn’t seem to me that I was expecting too much from them to at least take one quick look at it. To their credit, those two sisters read some of the postings and made a few very positive comments on some of my “Reflections”. As one of them put it “we just didn’t know there was anything there worth reading”. 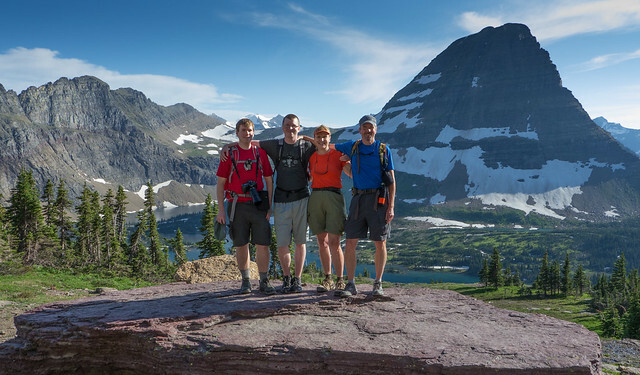 However, about six months after this I decided to write about two topics that I didn’t believe that any of my siblings would think were “worth reading”; National Parks and Trail Maintenance Crews. In addition the posts were getting longer so I decided that it was unrealistic, even inconsiderate, of me to expect busy people, such as my siblings, to read so much verbiage on topics that are of no interest to them, even if it was written by their sister. I now regretted that I had ever made an issue of it. After all, none of them had been interested enough to read it in the beginning and I didn’t want any of them to read it just because they feel obligated to. I also didn’t want them to feel guilty if they didn’t read it so I stopped letting them know when I had updated it. That was over a year ago. I still kept in touch with them through our family’s Yahoo Group. This email group was established years ago when we were working together to organize an elaborate birthday party for Mom and surprisingly enough we have continued to use it even after her death. It was not uncommon for family members to use it to announce events and travel plans, forward jokes etc. 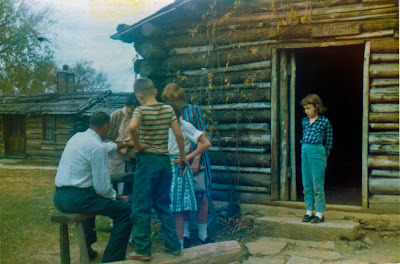 Often times there would be a few photos attached, primarily of grandchildren and recent trips. It was also not uncommon for one or more of them to comment on each other’s news and photos. However, I have struggled to come up with photos that any of them have found interesting enough to comment on. I thought I had it with this one. I thought it was really funny because we are all from Kentucky and were quite happy to leave Kentucky. 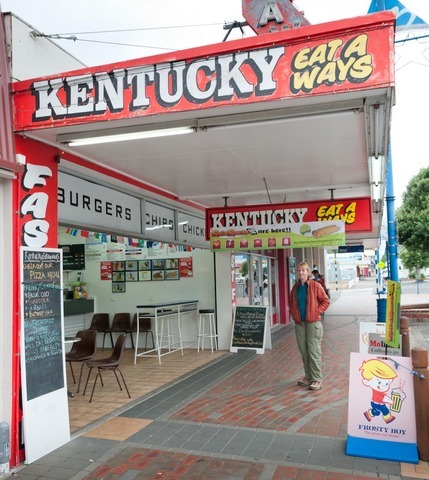 But here I was, halfway around the world, walking down a street in Picton, New Zealand and I found myself under a big sign that said “Kentucky”. 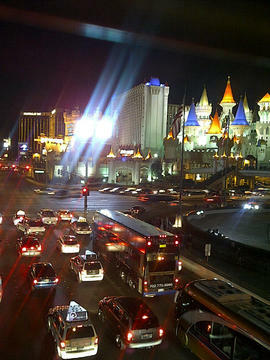 But apparently none of them found it as “comment worthy” as a photo that one sister had taken in Las Vegas. I know it sounds silly but the way this made me feel was that I was once again that little girl standing off to the side and I had tried to join the circle but they all ignored me. So I did the pouty little kid thing and essentially stopped posting anything to our family Yahoo Group. For awhile I did make an effort to continue commenting on their stuff. However, as time has passed they have all been posting less frequently and I haven’t been willing to try to get any kind of conversation going. Given that it had been over a year since I have said anything to any of my siblings about the blog I had stopped wondering if any of them would ever miss it ... well, I had almost stopped wondering. I’m reminded of a story that Dad liked to tell about me when I was little. The family was spending the day at Natural Bridge State Park in eastern Kentucky. 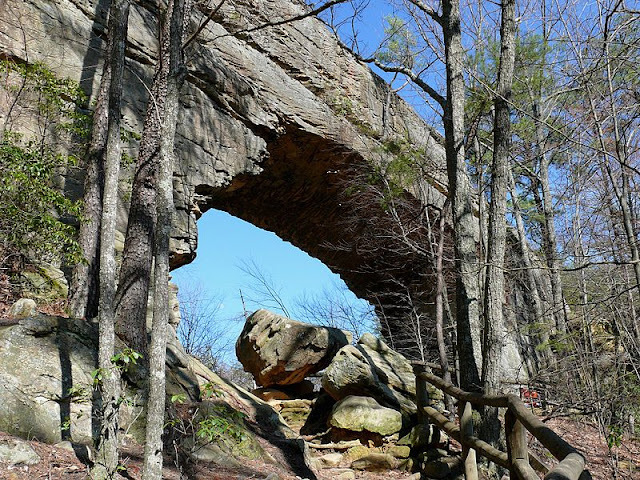 We had been to see Natural Bridge and were headed back to the parking lot. However, once they got to the car they realized I wasn’t with them so they headed back down the trail and found me waiting just around the corner on a different trail. I don’t remember the incident but I reportedly said “Nobody was paying any attention to me. You didn’t even miss me until I was gone”. I hope I’m not acting that childish now but the truth is that I am actually relieved that no one has asked about it. Because I have realized that if they don’t know when I’ve updated the blog then I can’t be hurt if they don’t read it and say anything about it. But just when I had figured that out, one of my sisters did ask about it and wanted to ensure that she was still on my contact list. My initial reaction was to ignore her request as it came at the end of an email discussing my coming to help her after her upcoming surgery. I assumed she was only asking out of a sense of obligation or she was trying to be really nice to me so I wouldn’t be tempted to hide her pain medication after her surgery (or worse, she was afraid that I would reenact that chilling scene from the movie “Whatever happened to Baby Jane?” where Bette Davis serves a dead rat on a plate to her invalided sister played by Joan Crawford). However, while I was at her house after her surgery she made a second request and I have to admit that she sounded sincere (although it could have been her pain pills “talking”). Obviously the adult thing to do is to add her back to the blog contact list. But I am still reluctant because she had been the most vocal about not having time to read it. In addition she has made some odd comments about our current lifestyle, living and traveling fulltime in a motorhome. She apparently believes the only reason I am living this way is because John wants to. She also thinks of me as “homeless” because I no longer live in a house that is permanently stuck to a piece of dirt. Just because it has wheels doesn’t mean it isn’t a "home"
So I’m not completely convinced that this sister seriously wants to read the blog. She apparently has no concept of who I really am so I’m not even sure that I even want her to read it now. Well, obviously I’m being childish now because there is nothing that any of my siblings can do to make me happy. So what is it that I do want from them? Well, I want them to realize that I’m not the person I was when we were growing up. Nor am I the person I regress to at family gatherings. I want them to know the person that I am now, when I am comfortable and in my own environment. I want them to know the person who can feel confident and competent, who can persevere and endure. And I would really like them to know the person who stood her ground when a grizzly came into our camp. I would like them to see that I am happier now than I have ever been. But I think this would be difficult for them because, even though my life now is quite different from what it used to be, in their eyes nothing has changed in the 35 years since I left Kentucky and moved west. It doesn’t matter if I am in Alaska or Arizona; to them it’s all the same, I’m still just their little sister who moved very far away. Of course if they wanted to they could learn about me by reading the blog. But I have finally come to understand that it has never been my role to be on a “stage” in this family and that it has never been their role to be in my “audience”. This doesn’t mean that I don’t belong on a “stage” and it also doesn’t mean that I don’t already have an appreciative “audience”. At this point in time there are 15 people who are “following” this blog. It may not sound like many compared to the number of followers that other blogs have but to me it’s a crowd and I am extremely flattered by every one of them. In addition quite a few people, some we know but most we don’t, have made some wonderful comments. So I have decided that it is time for me to cut my siblings some slack and accept them just as they are. I realize that they may never stop thinking of me as the little sister who doesn’t know her own mind and can’t finish her own sentences without their help. I accept that they may never choose to see me “perform” on my blog “stage” ever again. Therefore, I have decided to honor my sister’s request to be put back on the contact list. Another part of accepting myself is to acknowledge that I still have an unmet need that is legitimate. I still have a need for someone in my family to be proud of the person I have become. But if it isn’t going to be one of my siblings then who could that be? Well, it has finally occurred to me that it would have been Dad. He grew up in the Appalachian Mountains of eastern Kentucky and wanted to spend what little free time that he had, “in nature”. 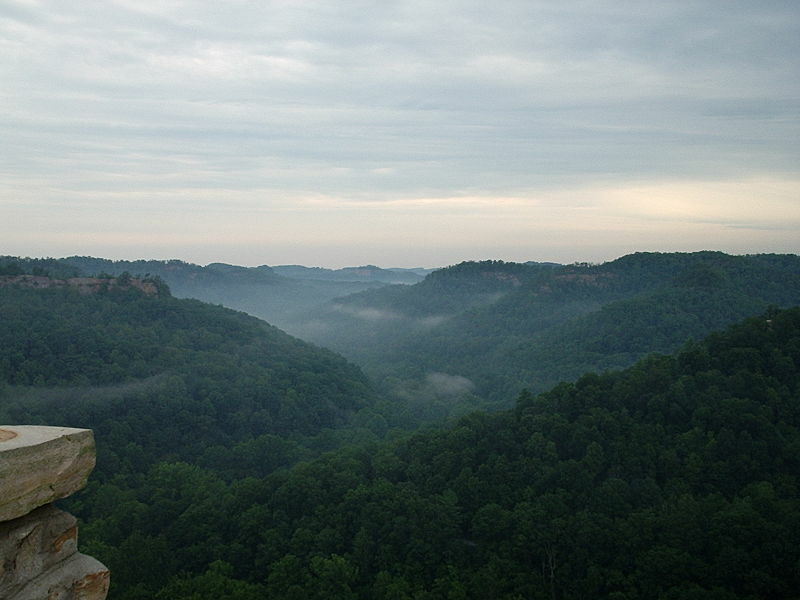 Red River Gorge in eastern Kentucky was probably his favorite place. I believe that if Dad was still alive he would enjoy hearing and reading about our backpacking trips. Something he loved to do was stand up and tell stories to anyone who would listen. We, his children provided him with much of his material, such as my sister complaining that our brother broke her clarinet after she hit him over the head with it and my being knocked unconscious but the X-rays of my head “showed nothing”. He would have lived vicariously through my adventures and crafted more stories (I know that some of them would involve bears). Most importantly, I believe that Dad would be proud of me and I have decided to be content with that. So where does that leave me in terms of my relationships with my siblings? If they aren’t going to be part of my “audience” then what part do they have in my life? Not long ago John jokingly said that my family was only interested in me when they wanted me in their audience or they wanted me to take care of them after surgery. There is a lot of truth to that although I can’t promise them that I will attend every future “performance” or help after every surgery. However, there is one more situation where my family is interested in me and one that I am equally interested in them as well. It can be summed up in one word – “Rook”. 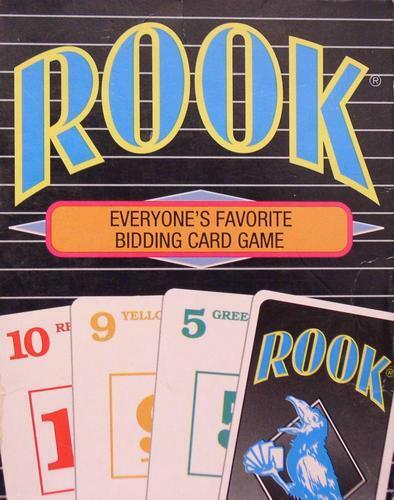 You see, we all inherited Dad’s obsession for playing the card game “Rook”. I imagine that we all have good memories of watching him play because it must have given him a badly needed break from his worries and stress. Playing Rook enabled him to relax and laugh. No matter how bad his cards were or how low his score was he still had fun and just seemed happy. Even after he was gone whenever there was some sort of family event; a wedding, a reunion and such, one of my siblings would pull out a deck of Rook cards and we could spend the next several hours playing nonstop. We have all taught our spouses and children to play Rook but not many truly enjoy it, some even hate it. Even when we play it with those who say they like the game, it just isn’t the same. They simply don’t have the same passion that my siblings and I have for the game. They also don’t understand how much we need it because it is the only thing that enables us to spend time together laughing, at our misplays, our losses as well as our good luck and triumphs. So what I know now is that even if none my siblings ever read the blog that I do in fact, matter to them and they matter to me. Because anytime three of them are planning to be in the same place at the same time then they need me since Rook is a four-handed game and they can’t play it without me! I always love your blog posts. John's photos are incredible. Each picture is incredibly beautiful. 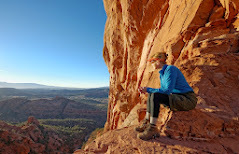 Thanks for sharing your adventures and thoughts on this blog. At some point our travels will cross and we can play a good game of Rook -- one of our family favorites as well. Thanks for the kind words. Looks like you're sure enjoying retirement. 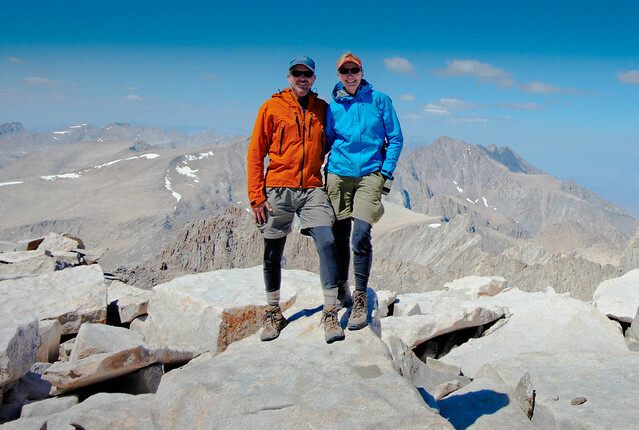 Congratulations on the Half Dome climb. 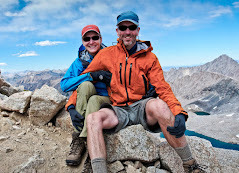 Jean and I climbed Half Dome in 2011. We backpacked in from Tuolumne so we started a lot closer. We climbed the cables in the dark and were on the top for sunrise. John & Jean - Hope you had a great CHristmas with the kids. It's been great following your adventures. I had my hip replaced in Sept, on the anniversary of my retirement. Back up and doing well - we'll be in Scottsdale in Jan for the Barrett-Jackson car auction.....always love the sun in January....so different than Washington! Take care!